It's time! 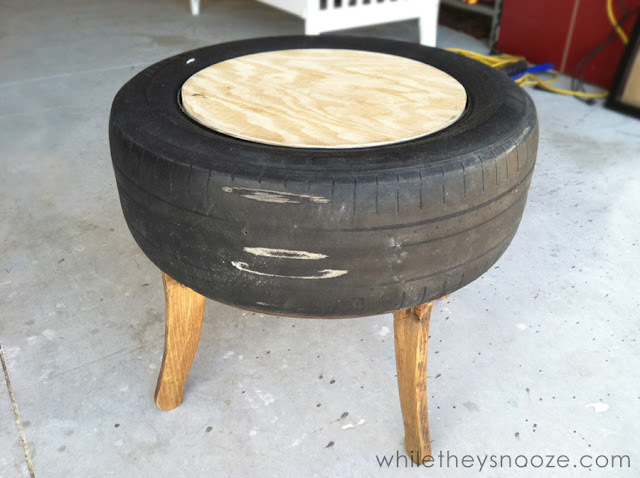 Time for the tire table tutorial. A lot of you know, I competed in Creating with the Stars back in March and this sucker sent me to round 2. It was a really great, busy, crazy, stressful, non-sleeping, couple of weeks. I'm thrilled I got to be a part of it (and talk to Sarah, Thrifty Decor Chick, WHAT!) but I think I'm still recovering. Now on with it. On a run a week or so back, I passed a house in my neighborhood with 6, count 'em 6, old tires on the curb (Where you at HOA??). My slightly hoarderish brain immediately tried to think of projects I could use them for. Alas, as Beyonce blasted in my ears, I thought of nothing and ran past. Fast forward a few days to when the Creating with the Stars announcement was made and I learned theme one was Upcycle (and that Sarah was going to be my partner!). In the midst of picking my jaw back up off the floor, I remember those grimy tires. Early Saturday morning, still bra-less and in my PJs, I drove to that house and hurled the one tire that was left into the back of my car. Let's hope the morning fog prevented most from seeing that. 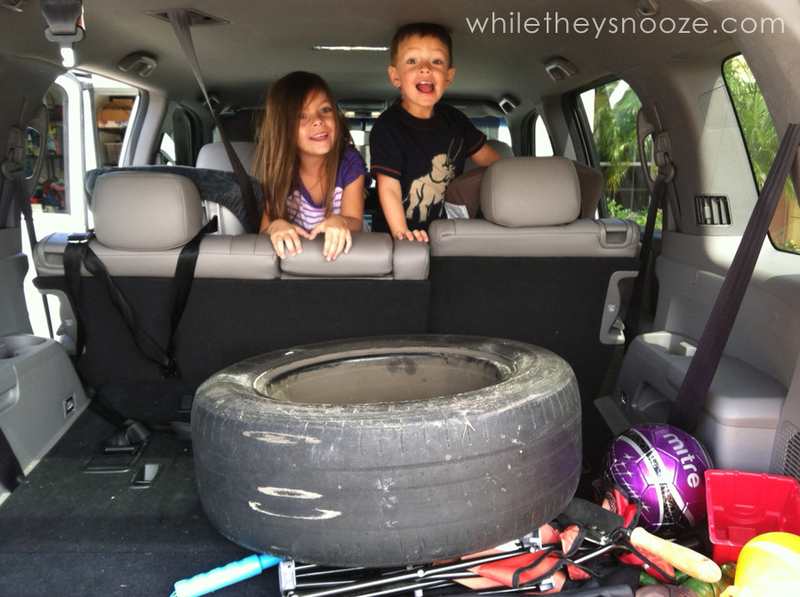 Don't be fooled, though the kids look excited, they are confused as to why mommy threw garbage in the car. 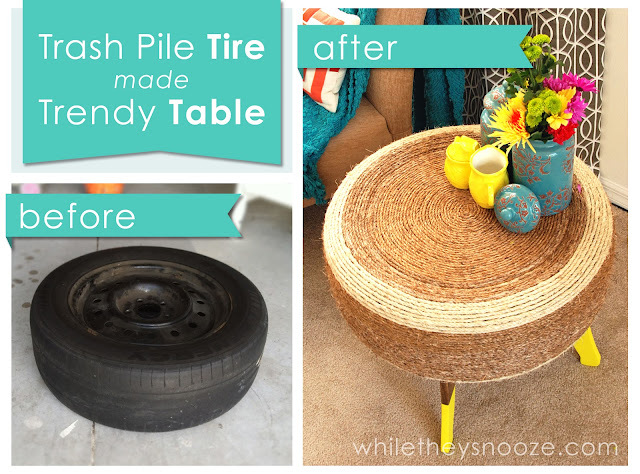 As the tire lay in my garage, it dawned on me that it was the perfect size/shape for a side table. 24" round. Just needed some legs and some (a boat load of) prettying up. Here's what I did. Old tire - Mine still had the rim... it will still work if it doesn't. 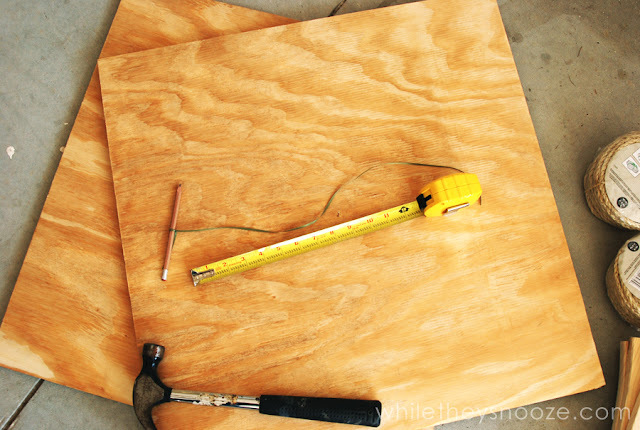 Plywood - One circle for the base and one for the top. My plywood is 1/2" thick. Legs - Get creative! 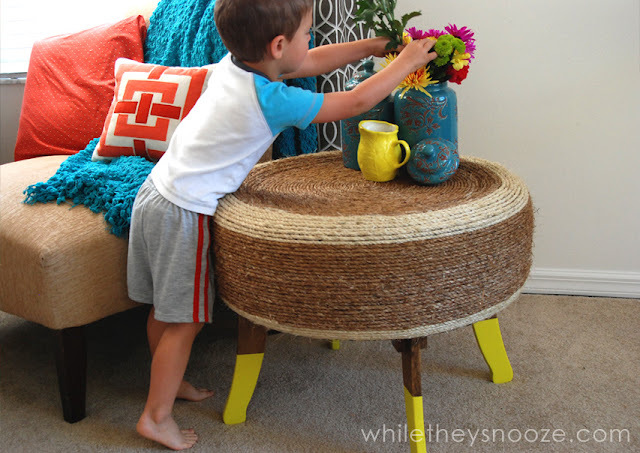 I used wood but you could use an upside down flower pot, metal, or buy pre-made legs from Ikea. 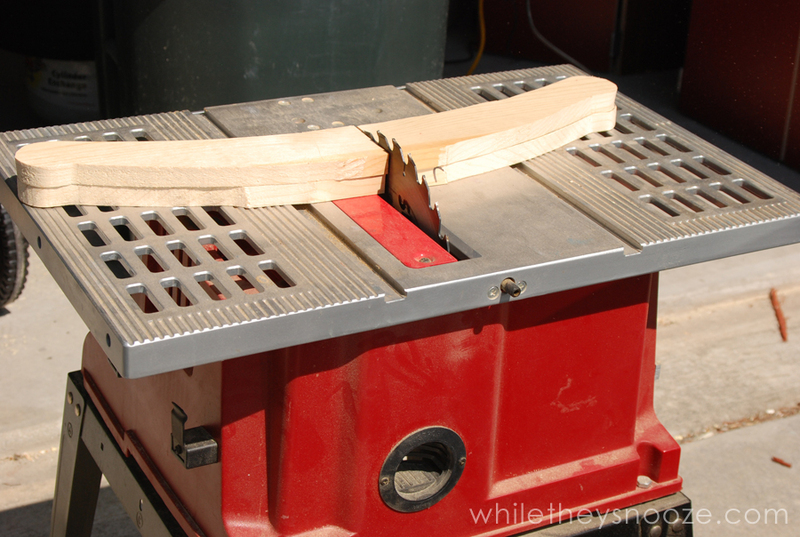 This tutorial will show you how to make wood legs. Rope - to disguise the tire. I used 350 feet (yikes!) 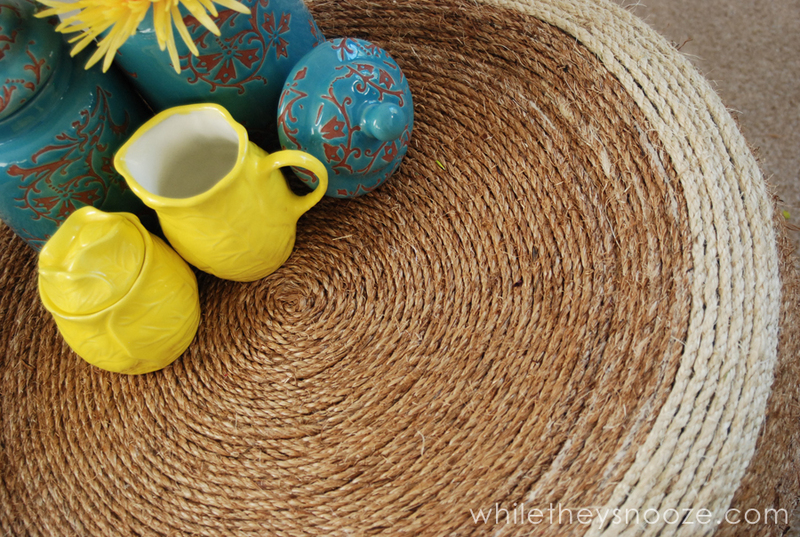 of 1/4" sisal and manila rope sold in little bags at Home Depot. 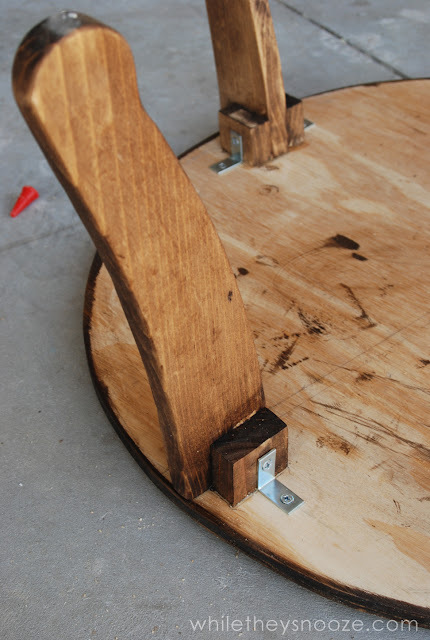 Glue/Screws/hardware to attach the legs - This will vary depending on what legs you get. 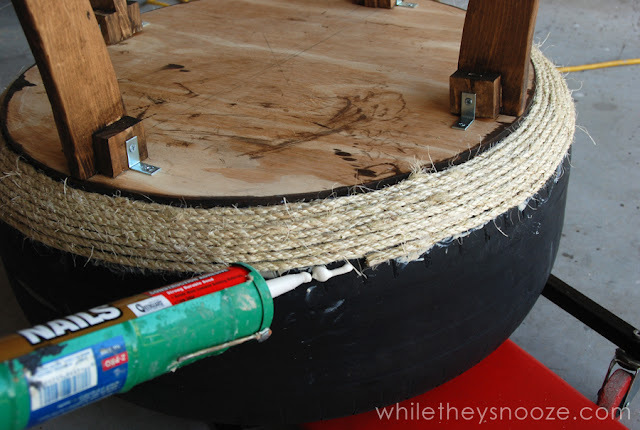 Construction Adhesive - To glue the tire to the base and the rope to the tire. I used Liquid Nails. Basic tools - This will vary depending on what your base is made from. 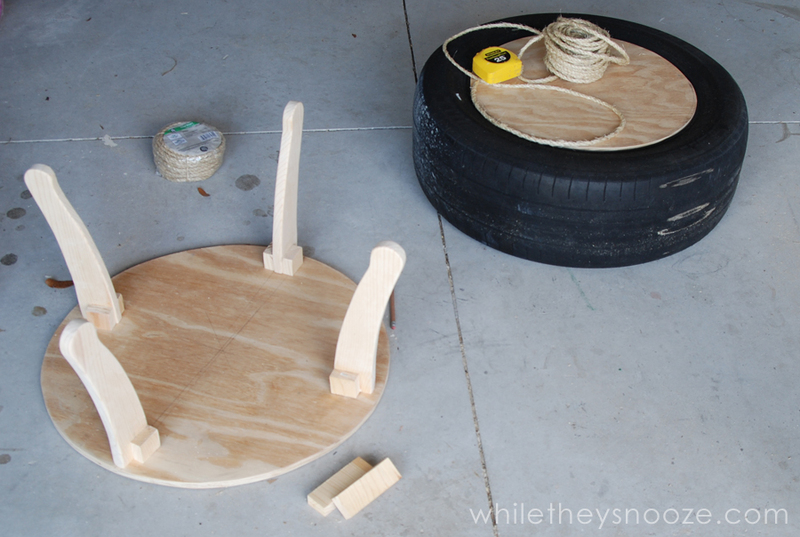 I used a jig saw to cut the circles. 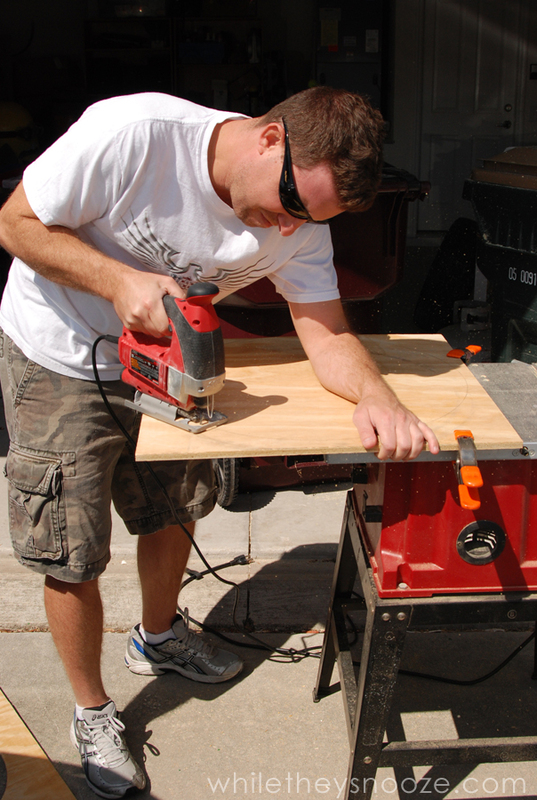 A chop saw, table saw, and jig saw the cut the legs. Drill to attach the legs. Chances are it's going to be really grimy. Give it a scrub with some dish soap to cut the grease. This will also help your adhesive stick better. Let it dry. Cut out two plywood circles. 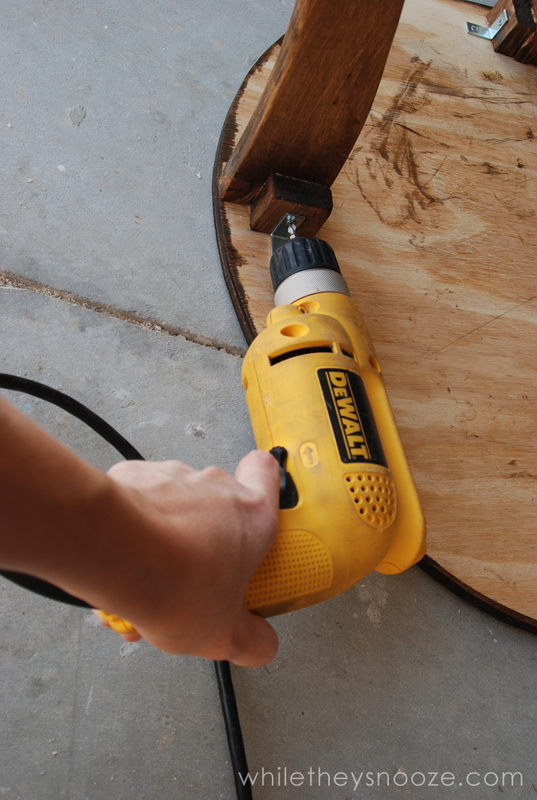 First circle should fit in the center of your tire to make a flat surface to form the table top. 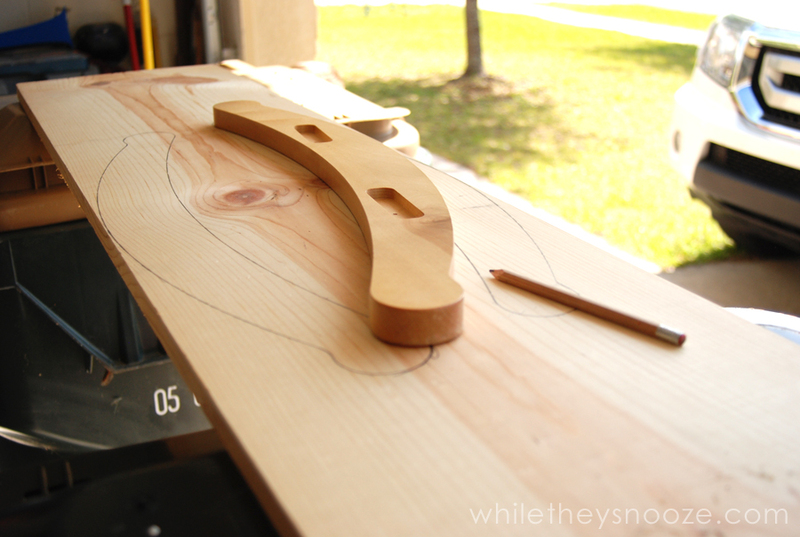 I measured, then nailed a piece of string into the center of my plywood, attached a pencil, and drew the circle. I had to sand the edges of the circle here and there to make it fit in the tire. The second circle is the base that the tire will sit on. Trace your tire and cut the circle one or two inches smaller than that. Since this table will be replacing another (ugly) table in my living room, I measured the height of that existing table. It was 20". The tire is 9" high, so I needed 11" legs. Side tables vary in height though. They should work well with the seating they will be next to. So measure your tire and then figure out how high you need your legs. 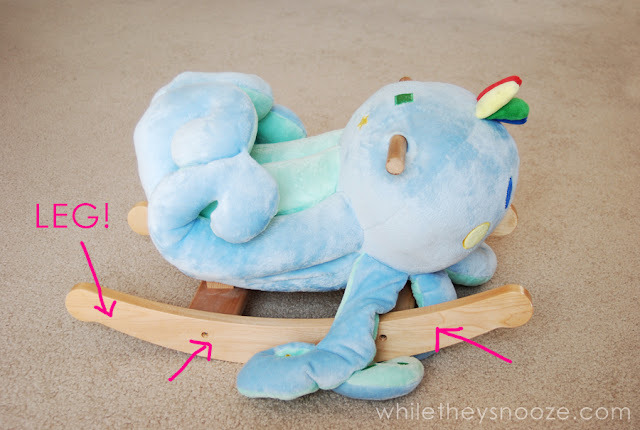 I must confess, my husband came up with the idea of using the rocker slats from our rocking octopus, cut in half, for the legs. Since I didn't want to destroy the octopus (poor Ollie! 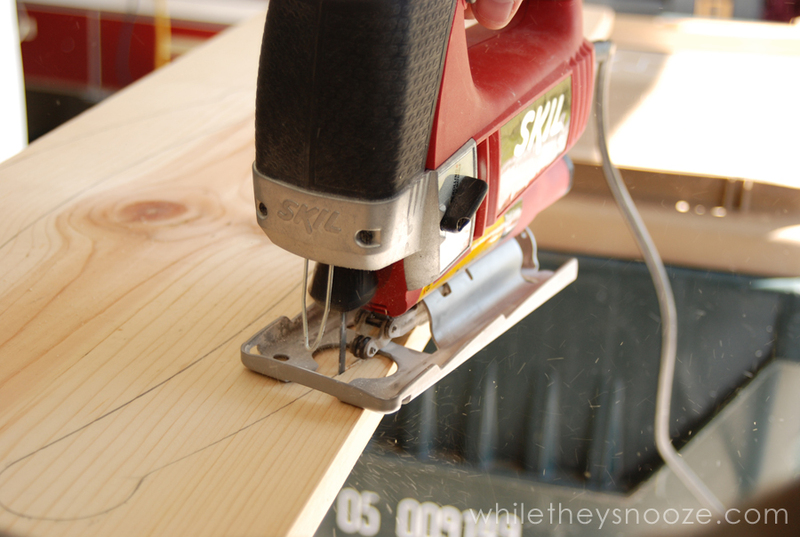 ), we took them off, traced them onto some scrap pine from the garage, and cut them out. If you don't have rocking octopus legs to trace :) rectangles would be fine! Cut in half and sand smooth. 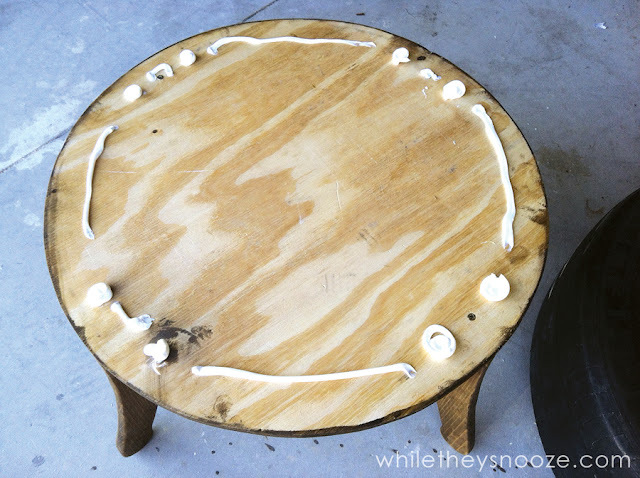 Take your larger base circle and arrange the legs equally spaced around the perimeter. 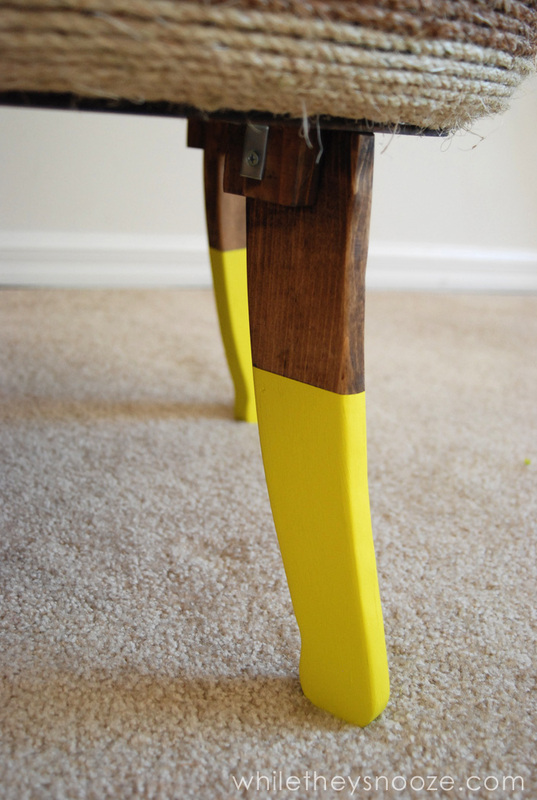 To make the table a little more sturdy, I cut some small blocks from the scrap pine to use as supports for the legs. 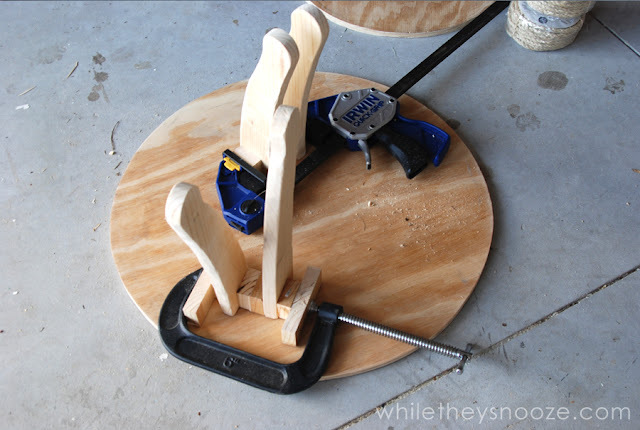 I glued the blocks to the legs with wood glue and clamped overnight. 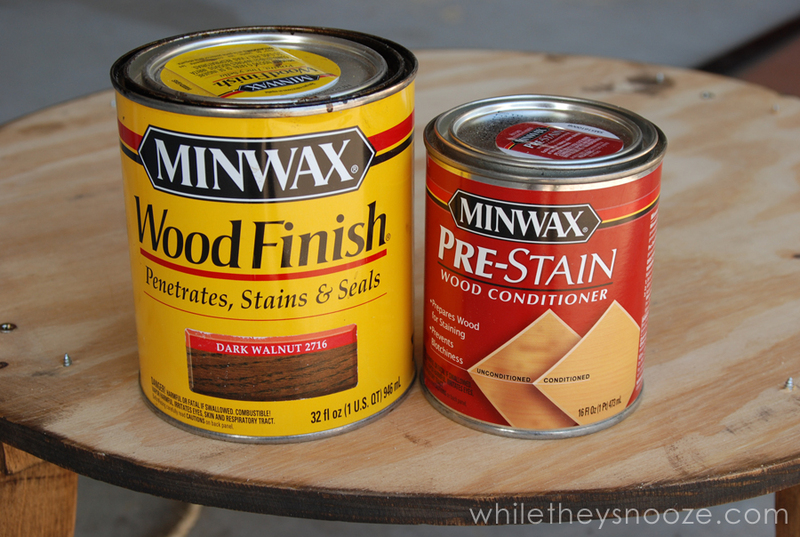 Once they were dry, I glued them to the wood circle, attached L brackets, and put a screw in through the top of the wood. 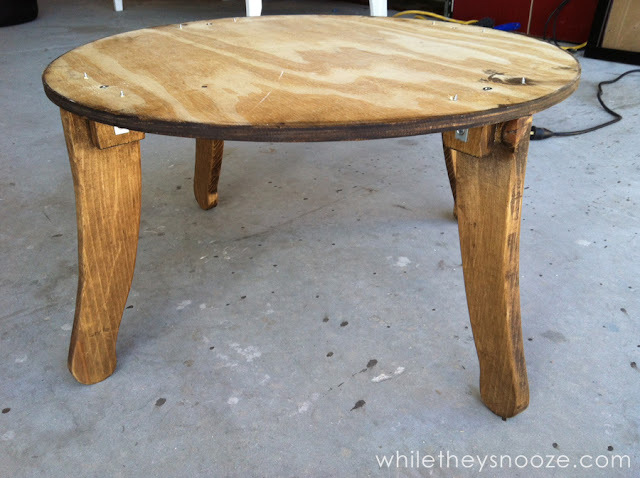 At this point I stained the legs and the rim of the base circle. However, they didn't turn out that great. I'll fix that in a minute. 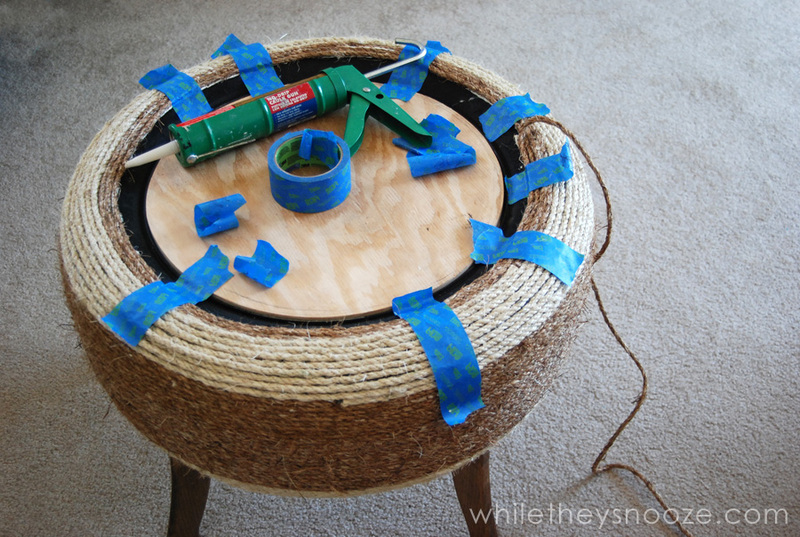 Once the legs are secure and dry, flip the base over, apply generous blobs of construction adhesive, and set your tire in the center. 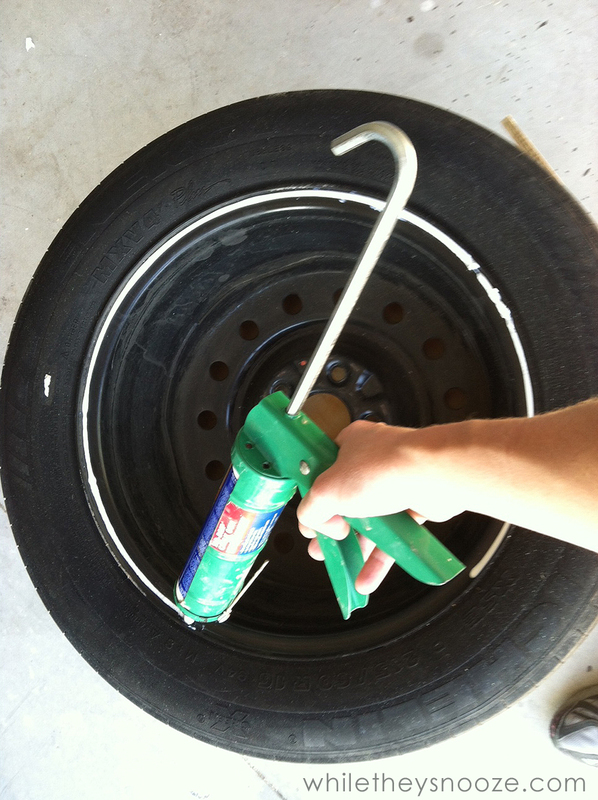 Glue smaller circle to top of tire. 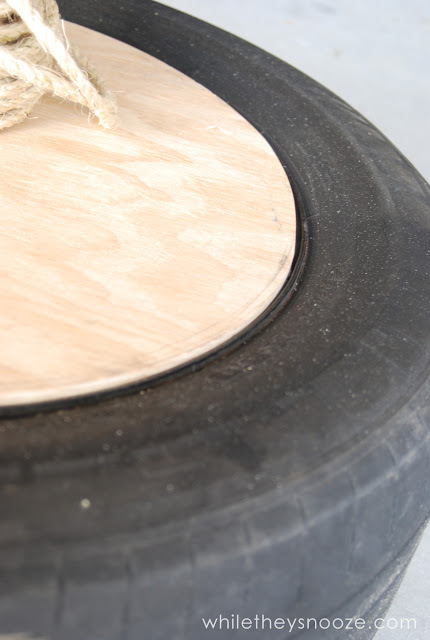 The smaller circle should fit slightly inside the inner curve of the tire so when it's in place, the whole surface is flat... or close to flat. Since my tire has the rim, I just glued to that. Attention: hot glue does not stick to tires just incase you were considering it. :) I tried... no go. Stick with the liquid nails. Bonus: Liquid nails is the same color as rope. Some of it bled through. You can't even tell. Turn the table over, start around the base, and work your way to the top of the table. Keep going! Once you get around the lip it's easier if you flip it back over. I used a combination of sisal rope (the lighter color) and natural manila rope (the dark color). Both are sold in 50' sections at Home Depot. Once you get to the top rim it gets tricky. The rope kept wanting to pop off so I had to keep it taped down with painter's tape as I went until the adhesive dried. Remember how the stain on the legs came out kind of meh? 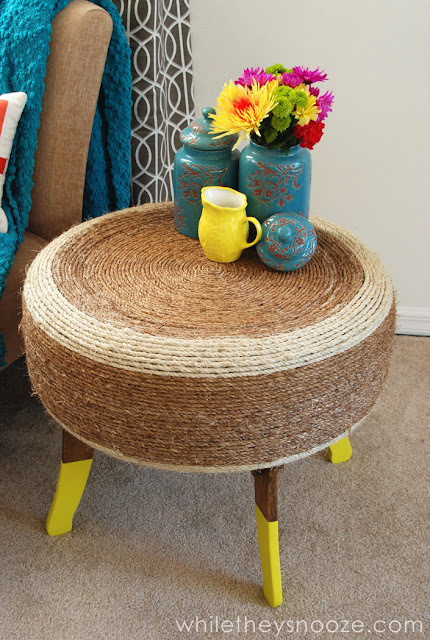 Sarah from Thrifty Decor Chick had the great idea to "dip" them. Basically, I painted the bottom half of the legs bright citrus yellow. Not meh anymore! I think this is my favorite part of the whole thing. And that's it. You can put the rope down. You're done. 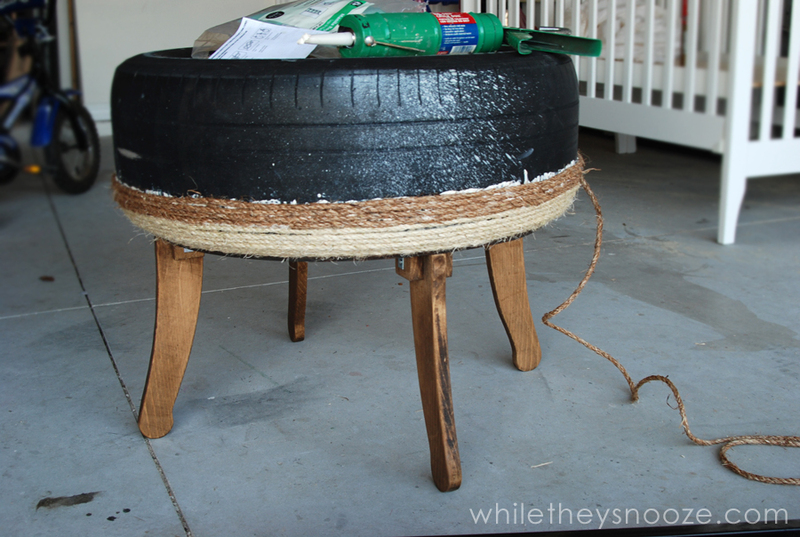 I can't wait to have people over and see if anyone knows it's an upcycled tire! 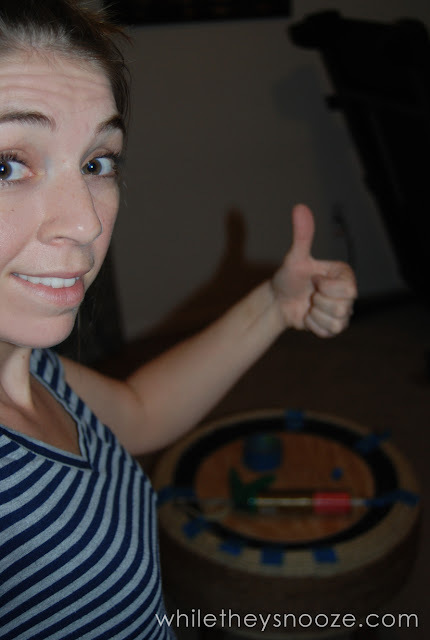 And so you know how CRAZY hectic Creating with the Stars weeks are with a 9-5 job and 2 kids... here's a lovely shot I took of myself, gluing rope to a tire at midnight while the rest of the family snoozed. Enjoy. I'm still so in awe of this project, Sarah. 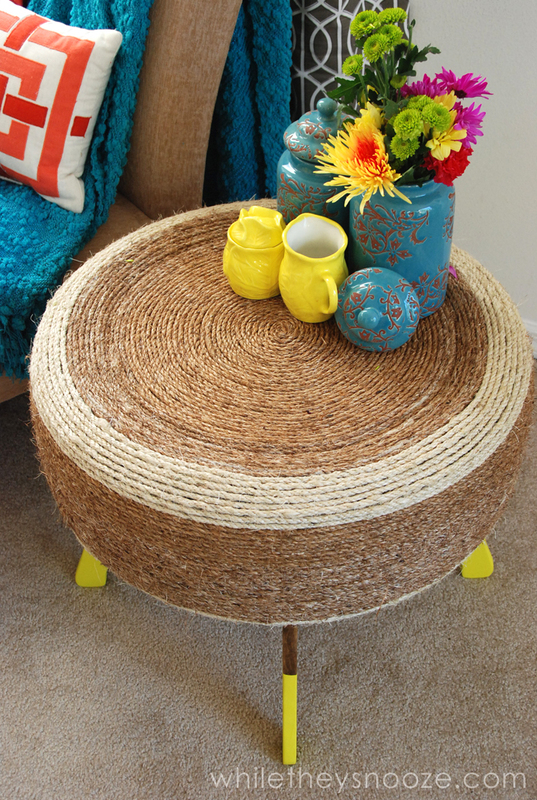 This is the ultimate "trash to treasure" makeover. 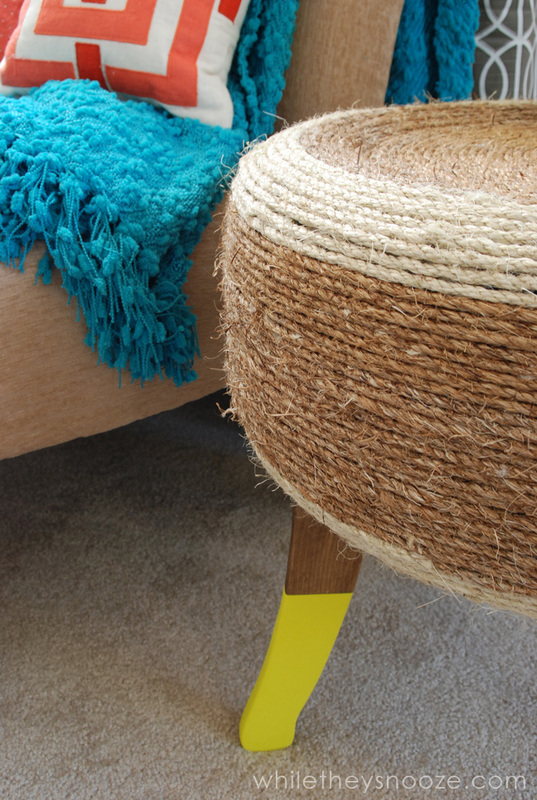 I love those yellow "dipped" legs and the contrast of the two types of rope. Plus, you've got staging skills, m'dear (or maybe it was your sweet staging assistant who is responsible). Thanks for re-posting so we can all drool again! Pinning! Thanks Lauren! My staging assistant does house calls. He's paid in Goldfish and ice pops. Thanks Yvonne! This would make a cool ottoman too with shorter legs! Can you still smell the rubber? 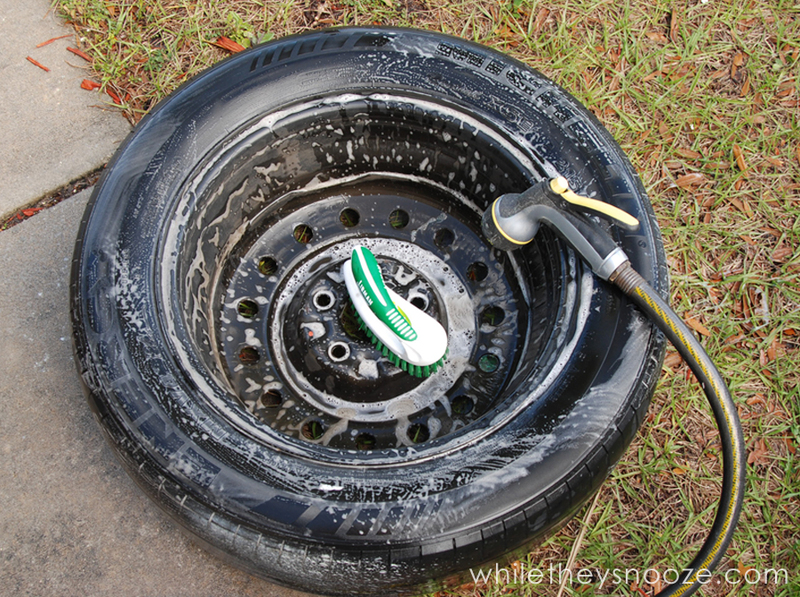 Tires can smell pretty strong whether or not they're scrubbed clean. Hi Anna! First question EVERYONE asks me. Not at all! As soon as I came up with this idea, that's the first thing my husband said... "it's going to stink!". But, I don't know if it's because the tire was old and outside for a long time, or what, but it has no smell. I get headaches so easily with chemically smells and exhaust and things like that, and this only smells like the rope I glued on it. 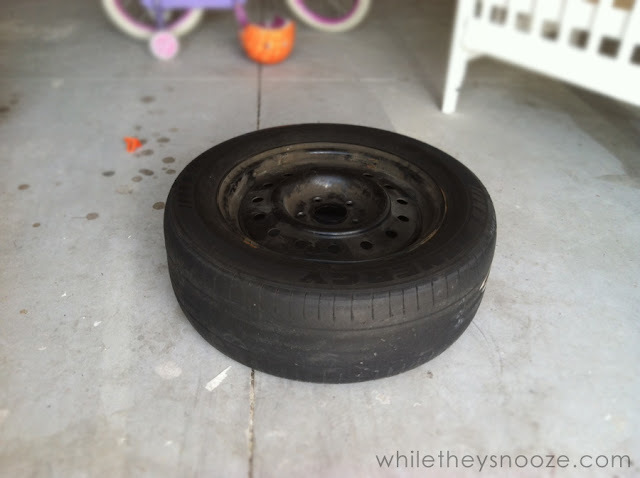 We don't smoke and have no pets so our house is always pretty stink-free :) and I haven't noticed any difference with the tire. It's been in the living room since March. BUT, I would also say, this would make a great out-door project. So if anyone is worried about a smell... stick that sucker on your patio! :) Thanks for asking. Every time I see this I'm still so crazy impressed at what you made! I have four old tires sitting in the garage and I am thinking about recycling it like you did. I don't have carpentry skills though. 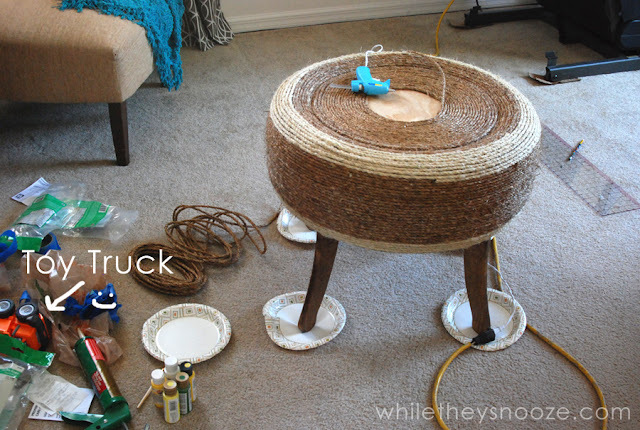 How much rope did you use at what price, very cute but sounds like it may cost alot with all the rope. But cery cute & creative. did it really take 350 feet of rope? Ahahaha! You totally just made my night and now I want to smear mustard on wood to see what happens! This is an awesome table.. I would like to make one for inside and one for the deck. 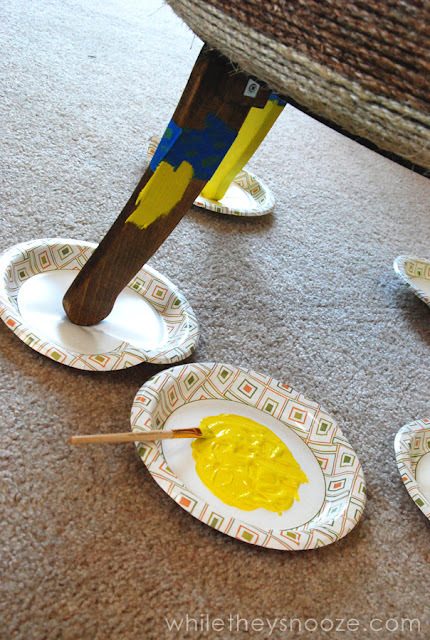 I have a handyman sweet husband and he will help me , I'm sure, I love the legs with color and it is just so cool and it looks like it would pop in any place. Congrats and thanks for sharing. This makeover is awesome. I am definitely gonna try it with my bike's tire. 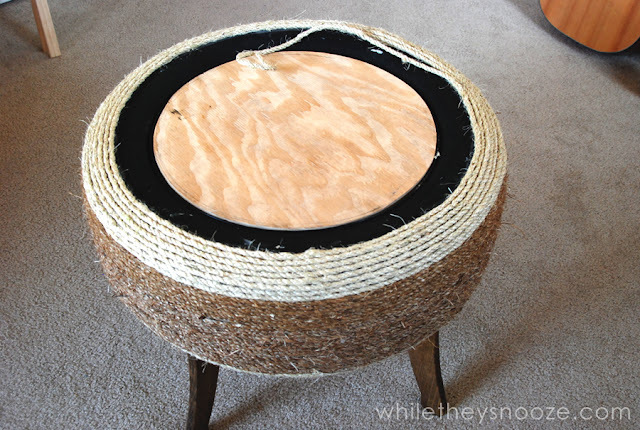 However, I am planning to make an ottoman out of it, without any legs (I am not that good with my carpentry skills), Thanks for sharing the great idea.